We noticed that the post describing our several-days-long trek to Ala-Kol Lake in Kyrgyzstan is still enjoying considerable popularity so… it’s time for a description of another trekking trip. This time we’ll write about our visit to Ala Archa National Park located near Bishkek. It may be a good option for those who cannot spend much time in Kyrgyzstan but would like to experience the mountains … quite high mountains. Please remember that the materials posted in here shouldn’t be the only materials you fall back on while preparing yourself for trekking. We nevertheless hope that our day-by-day description, as well as the map with the route plan, will prove useful for some of you or maybe even inspire you to travel. Depending on the time of the day at which you reach Alplager Camp, your trip will begin either in the afternoon of the same day or in the morning of the next day. If you arrive at the camp before 3 in the afternoon, you may go ahead and start your trek on the same day and spend the night by the waterfall. The base where the proper trek starts is situated at 2126m. The waterfall, which is the destination of the first day of your trek, is located at around 2700m. It means that at 3,5km-long distance you’ll go upwards ~564 m. The path is clear and it’s virtually impossible to get lost (blue trail – Ak-Sai Waterfall Trail). Apart from that, it’s fairly popular and you’ll meet on it numerous fellow trekkers. At first the trail is rather steeply sloped and it leads you through a forest. Once you cross the forest, you’ll see a picturesque view of the Ala Archa and Ak-Say River Valleys surrounded by 4000-meter-high summits. After around another 2,2km the path becomes easier and flatter and it leads softly up the mountains among the grass and low bushes. After climbing around 3,2km you’ll cross Sharkyratma River and only after 500m you’ll finally reach the waterfall. It takes around 2,5-3h to get from Alplager Base to the waterfall, so if you begin your trek in the afternoon, the area near the waterfall would be a good place to spend the night. If you start your trek in the morning, you may confidently continue the trek and spend the night in Racek Camp located two hour away from the waterfall. In that way you may shorten your adventure by one day. 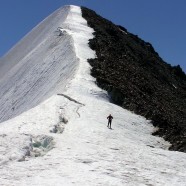 The destination of the second day will be Racek Camp located at around 3347m. You’ll go up 650m while you cover the distance of 2,75 km. Right behind the waterfall lies the forest boundary and the path starts to get more and more steep. The trail is set along the left bank of Ak-Say River from its starting point until Racek Base. You’ll have to cross a tiny river somewhere along the way. You’ll see there chains designed to help trekkers cross the ford (a rare view in the East… chains which are supposed to facilitate anything). The trail becomes very steep behind the river. The path is rocky and trekking poles might really come in handy. It takes two hours to get to the base, so if you set off early enough in the morning, you can spend most of the day on acclimatization and feasting your eyes on truly beautiful views. Racek Base is a building – inhabited one, to our surprise. There is a waterfall next to the building where youmay restore your water supplies. The water falling from the waterfall forms a small river, along which you may pitch your tents (here also somebody installed chains). There is more than enough space for the tents and -most importantly -you may set them up free of charge. Interestingly, the base is covered by mobile networks. Today you’ll attack the summit. The height of the Peak Uchitel is disputable. In fact nobody knows for sure what is its exact height. The old Soviet maps speak about 4540m, other maps give 4527m, while according to the website (http://plwikiloc.com/wikiloc/home.do) presenting the route on satellite map the height of the Peak Uchitel is 4552m. It’s best to start the summit attack fairly early in the morning (5-6). Don’t take with you your tent and other unnecessary equipment to the top. Leave them in the base and trek without excessive load. It’ll take you around 7 hours to get to the top and go down. You need to climb up 1200m. The trail starts behind the waterfall where it turns left steeply. There is no denying that the path leads up a very sharp slope. At fist you’ll climb turnings strewn with small rocks crunching and falling down from under your shoes. After some time the path will turn left behind the rocks shooting upwards. You’ll see there mounds of stones indicating the right way. From there on you need to go up a stony path until you reach an even ground. On that “plane” you need to turn right in the direction suggested by the stone moulds (it’s as if you went along a ridge leading to the main ridge of the Peak Uchitel). From there on you have to climb a path which gradually becomes very rocky. The stone moulds placed along the way make orientation much easier. The higher you get, you’ll see more and more snow lingering on the stones and between them. You need to take every single step carefully. After a long and exhausting climb up you will approach certain rocks. It’s easier to get past them when you try from the right hand side. Climbing irons would prove very useful at that point as the trail leads now through an area covered with snow. If you don’t have them and you are nevertheless determined to reach the summit, you may follow the tracks of other tourists (at your own responsibility). When you reach the main ridge after going through the snow, you need to turn right. 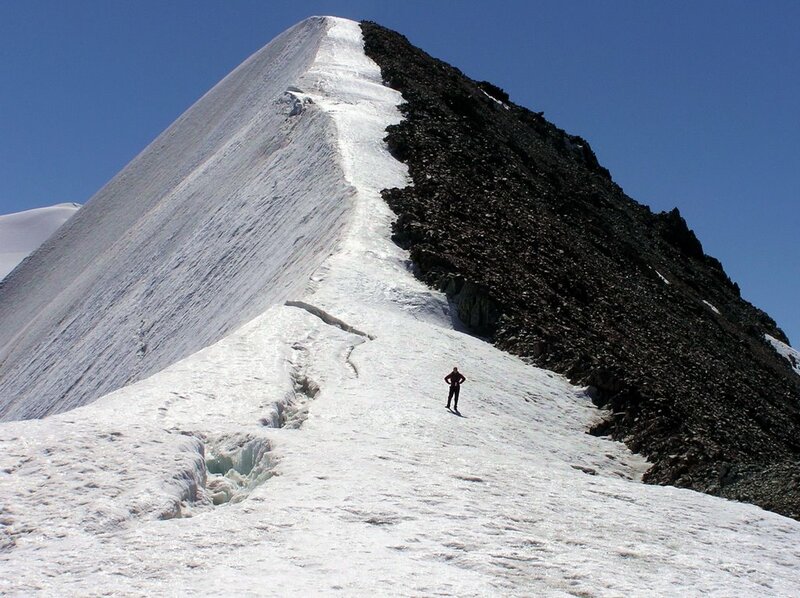 Only a small distance separates you now from the Peak Uchitel. We advise you to choose the side on which you have already climbed as the ridge is packed with loose snow and snow overhangs. You also should remember to take with you sunglasses as up high the light reflected by the snow shines strongly both from above and below. You’ll be on the top in around 3,5 hour depending on your pace and weather conditions. After a moment of reflection on the peak start descending to Racek Base -it’ll take you around 3 hours. You may use the rest of the day to recover. Spend the night in a tent in the base. Going down from Racek Camp to Alplagier. You may spend the night in the Park or simply return to Bishkek. Route description available courtesy of George Maximilian Bartosz Czajka – our friend and travel companion from Kyrgyzstan and Uzbekistan Trip ! Attached filles that is complete map of trekking described. Just combine all parts together after printing and you have map for your trekking ready! Interesting? Read more about Kyrgyzstan! thanks for the interesting trip description. I was wondering at what time of year did you do it? We plan being there beginning/mid september, could it be too much snow without “glacier equipment”? We’ve been there in August so it was high summer period, almost no snow over 4000 m. I think in September can be little bit harder and “glacier equipment can be useful, just safety.